If you’ve read the Silmarillion, you know who Fëanor was. If you don’t, Fëanor was the dickhead who created the Silmarils: three indescribably beautiful and magical jewels that contained the light and essence of the world before it became flawed. They were the catatlyst for basically every important thing that happened in the First Age of Middle Earth. It is thought that the inspiration for the Silmarils came to Fëanor from the sight of Galadriel’s shining, silver-gold hair. He begged her three times for single strand of her beautiful hair. And every time, Galadriel refused him. Even when she was young, Galadriel’s ability to see into other’s hearts was very strong, and she knew that Fëanor was filled with nothing but fire and greed. Fast forward to the end of the Third Age. Gimli, visiting Lorien, is also struck by Galadriel’s beauty. During the scene where she’s passing out her parting gifts to the Fellowship, Galadriel stops empty-handed in front of Gimli, because she doesn’t know what to offer a Dwarf. 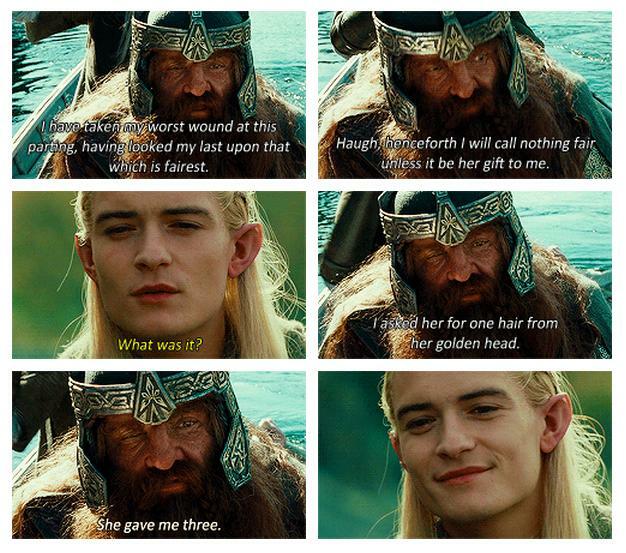 Gimli tells her: no gold, no treasure… just a single strand of hair to remember her beauty by. She gives him three. Three. And this is why Gimli gets to be an Elf Friend, people. Because Galadriel looks at him and thinks he deserves what she refused the greatest Elf who ever lived—- and then twice* that. And because he has no idea of the significance of what she’s just given him, but he’s going to treasure it the rest of his life anyway. I didn't finish The Silmarillion, so I wonder; Is that true? Did Tolkien confirm this interpretation? *: "twice" is in the source being quoted here; "three times" of course would be the correct amount but "twice" is retained to preserve the quote. In a letter that invites us to see the exchange between Galadriel and Gimli against the back-drop of the earlier encounter between Galadriel and Frodo, Tolkien indicates that until Frodo’s arrival in Lothlórien, Galadriel had actually believed her own exile from Valinor to be not temporary but “perennial, as long as the Earth endured.” It was only after her intercessory prayer on Frodo’s behalf—that he should be allowed the grace Galadriel believed to be forever denied to herself, namely of returning to the West—as well as a reward for her refusal of the Ring and her part in the war against Sauron, that Galadriel discovered the ban placed upon her return to the West to be eucatastrophically and miraculously lifted (Unfinished Tales 229). The post goes on to suggest that Galadriel gave him the hairs because, ironically, the dwarf didn't want the hairs as a physical thing for himself. Rather, he wanted them as symbols of new friendship between elf and dwarf. Yes, this did happen. I don't remember if it's described in The Silmarillion or the Unfinished Tales, but three times Feanor asked for a strand of Galadriel's hair, and three times she refused because she could see the pride and darkness in him. I think in this quote: "For none have ever made to me a request so bold and yet so courteous", the key word is "courteous". It is the difference in the manner Gimli asks for the hair that I think is the reason Galadriel gave to him what she wouldn't give to the mightiest of all elves that ever existed. Also, it's true that while it's pretty hard to capture on film, Galadriel's hair is basically the eighth wonder of the world. As has already been answered, there is significance. Feanor asked for a single strand three different times and Galadriel refused him for his apparent (to her) dark intentions or mood. Frustrated, Feanor is inspired to make the Silmarils that will also capture the light of the trees of Valinor (as Galadriel's hair was poetically said to do). The Silmarils, in turn, cause pretty much all of the conflict read about in the Silmarillion. Fast forward a couple of ages to Gimli asking Galadriel for a single strand (as Feanor had done before). Before giving him three, Galadriel asks what he would do with it. "Treasure it, Lady,' he answered, 'in memory of your words to me at our first meeting. And if ever I return to the smithies of my home, it shall be set in imperishable crystal to be an heirloom to my house, and a pledge of good will between the Mountain and the Wood until the end of days." (Fellowship of the Ring, Farewell to Lorien). Feanor wanted the hair, but when denied, made jewels that he coveted far too greatly. It caused tragedy upon tragedy in Middle-Earth lasting for thousands of years. Actually, the last vestiges of the evil ripples caused by Feanor's oath regarding the Silmarils is undone with the destruction of the One Ring. Gimli also wishes to make it a jewel. However, in contrast, he will not covet it maliciously, but wishes it to be a symbol of good will between the peoples of Middle-Earth. Gimli, an otherwise unremarkable dwarf (from a historical standpoint) is surpassing the quality of the "greatest" of all elves. In a book filled with historical subtexts, this scene has one of the best and most important. It is showing that world history (along with many other things) has a chance at redemption. I think that in the book, Gimli doesn't even request three hairs. He refuses to request anything from Galadriel, yet Galadriel bids him to merely name his desire. It is only this that he does and only at her bidding. Contrast this with Fëanor, who twice disrespects or ignores her saying no. Had Galadriel denied Gimli, there is no way that he would have asked a second or third time. So since Gimli never actually asked, perhaps he got one hair for every time that Fëanor had bothered her. This scene is a nod to the backstory of Middle Earth, and forges their friendship. In the Silmarillion, Faenor [sic] captured the light of the Two Trees of Valinor to make the Silmarils… magical stones at the heart of Middle Earth lore that were “alive, imperishable, and sacred.” Legend has it his inspiration to craft these artifactss came from him being enamored by the hair of Galadriel. The Shibboleth of Fëanor: For Faenor [sic] beheld the hair of Galdriel [sic] with wonder and delight. He begged three times for a tress, but Galadriel would not give him even one hair. These two kinfolk, the greatest of the Eldar of Valinor, were unfriends forever. Legolas understands the significance, and approves. There is great information in the existing answers, but I believe the answer to the question is "No" Tolkien did not confirm this interpretation of why Galadriel gave Gimli three hairs. The story of Fëanor asking three times for some of Galadriel's hair is in Unfinished Tales and The Peoples of Middle-earth. For Fëanor beheld the hair of Galadriel with wonder and delight. He begged three times for a tress, but Galadriel would not give him even one hair. As Buzz points out in a comment, this was probably first written after The Lord of the Rings. The version I quoted was, according to Christopher Tolkien (in both Unfinished Tales and The History of Middle-earth), written in 1968 or later. 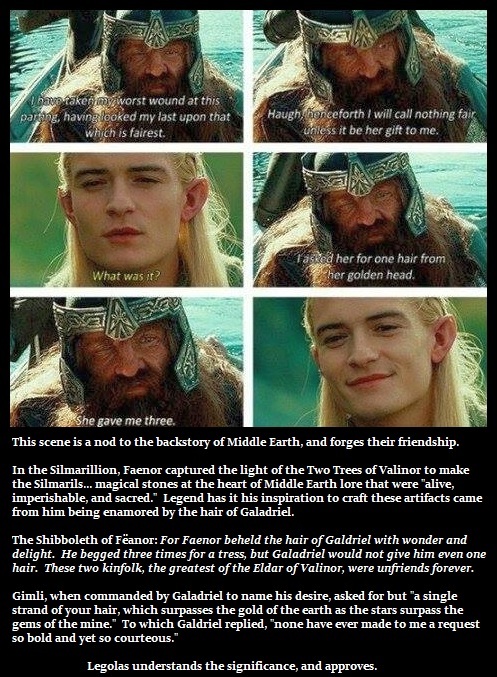 Might Tolkien have dreamed up the story of Fëanor's request after writing The Lord of the Rings in order to give additional meaning to Galadriel's gift to Gimli? Perhaps; or perhaps the he had thought of the story earlier and it influenced what he wrote about Galadriel and Gimli in The Lord of the Rings. 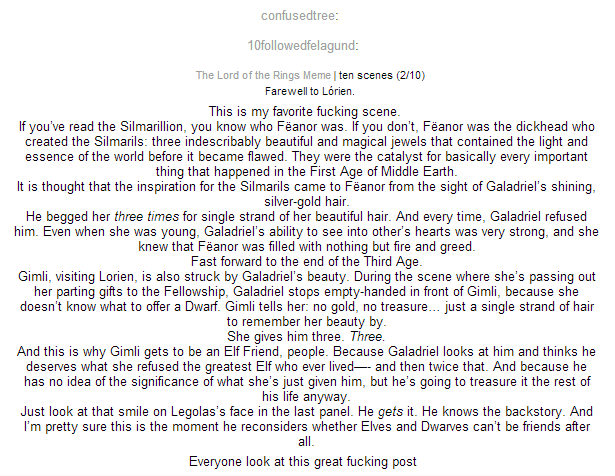 In the end, I think we must accept the story of Fëanor asking three times for a tress of Galdriel's hair as canon, and that in-universe it happened before Gimli met Galadriel. In that case, Galadriel giving Gimli three strands of hair when asked for one was either a coincidence or not. I choose to believe it was not, but you can choose as you like (and I think Tolkien would be okay with that). Not the answer you're looking for? Browse other questions tagged the-lord-of-the-rings tolkiens-legendarium elves the-silmarillion or ask your own question. Is there any significant meaning behind the term “Saruman of Many Colours”? Was Elrond, in Tolkien's opinion, more inherently powerful than Galadriel? Why did Fëanor refuse to give even one of the Silmarils to Yavanna to revive the trees? Would the One Ring have stayed hidden if Bilbo hadn't turned up? When Frodo offers her the ring, is Galadriel really tempted, or just making a point? How did Saruman's army reach Helm's Deep so quickly? Do Tolkien's works describe either Galadriel or Arwen as being more beautiful than the other? What is the significance of there being Nine Nazgul?